Why Micro-Gardening Could Go Big : The Salt Micro-gardens are small spaces, such as balconies, patios and rooftops, cultivated with planting containers like wooden boxes and trash cans. Now, creative reuse of old materials and some new tools for sale are making it easier for urban dwellers to stretch their green thumbs. The Nourishmat, which is inspired by Square Foot Gardening, makes it easy to grow 15 to 20 pounds of food in a small space with a plastic mat that serves as a garden planting guide. Most urban consumers are happy to leave farming to the farmers, but for those with a green thumb, it is getting easier to garden in the city. That's thanks, in part, to DIYers sharing ideas for reusing old materials to garden in and a new range of tools designed to get many more people involved with growing some of their own food. The U.N. Food and Agriculture Organization has lately been talking about micro-gardens as critical way to help the urban poor get more food on the table. The FAO defines micro-gardens intensively cultivated small spaces — such as balconies, small yards, patios and rooftops. Many rely on containers such as plastic-lined wooden boxes, trash cans and even old car tires. While it's probably tough to sustain a family on a micro-garden, FAO research shows that a well-tended micro-garden of 11 square feet can produce as much as 200 tomatoes a year, 36 heads of lettuce every 60 days, 10 cabbages every 90 days, and 100 onions every 120 days. Sure, micro-gardens can easily be created out of plenty of scrap materials: potatoes grown in a bucket or trash can, for example, or wooden pallets turned into an herb garden. Anne Gibson, an Australian who runs The Micro Gardener website, has aggregated many of the most creative ideas. And for folks who don't want to DIY it, several companies are also making it easy to start a micro-garden with an array of new products. Earth Starter is one such start-up. 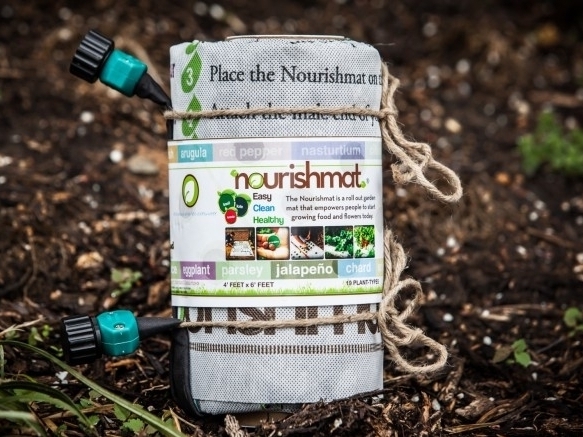 This month, the company launched a Kickstarter campaign to manufacture more of its all-in-one roll out garden tool, called a Nourishmat. 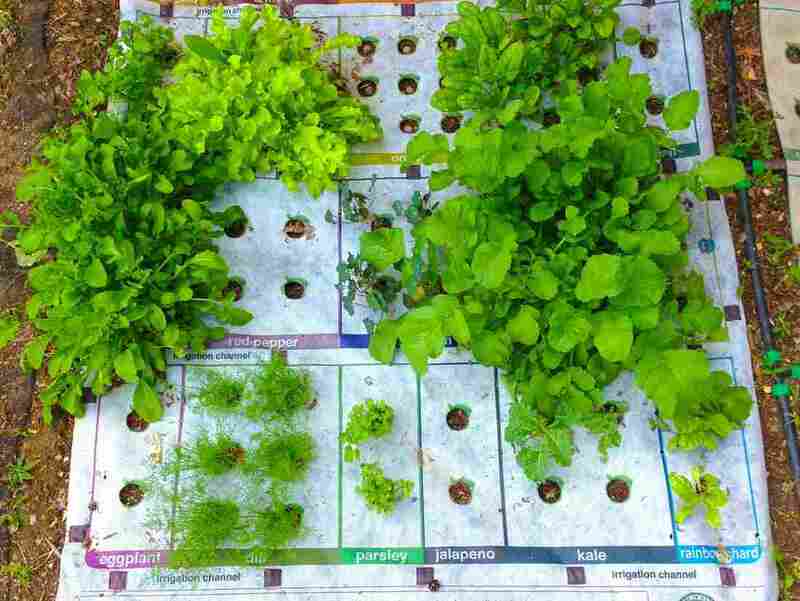 The Nourishmat, which is inspired by Square Foot Gardening, makes it easy to grow a lot of food in a 4-foot by 6-foot space by turning a plastic mat into a garden planting guide. The mat comes with seedballs (seeds mixed with clay and worm castings to enrich the soil, and chili powder to keep pests away). To plant, you simply lay out the mat on top of a bed of soil, then stick the seedballs for the 18 different vegetables and herbs in their respective holes. (Urban residents who may have soil contaminated with lead and other heavy metals will have to build a raised bed and fill it with clean soil.) The mat also doubles as a weed barrier. Earth Starter launched a Kickstarter campaign on July 1 to raise money to manufacture more Nourishmats. John Gorby and Phil Weiner, who founded in the company in 2011 while they were undergraduates at the University of Maryland, College Park, believe that there's a big market of people who want to garden but need this kind of help. "Everyone in the world should have a victory garden," says Weiner, referring to the food gardens that thousands of citizens of the U.S, U.K. and elsewhere planted during WWI and WWII to improve their food security. "But the most common excuses we heard for why more people don't spend more time gardening were 'I don't know what I'm doing,' or 'I don't have time,' or 'I don't have space,' " Weiner tells The Salt. He grew up gardening with his family in Washington, D.C. So far, Weiner and his partner have beta-tested the product with people in 22 states. They estimate that users can grow $200 worth of produce in one season and 25 to 30 pounds of food in a year. The mats can be replanted for three to five years, Weiner says. Right now, the mats are only available to people who donate to the Kickstarter fund, but Weiner and Gorby hope to raise enough money to eventually manufacture them on a big enough scale to sell nationwide. Weiner says he expects to charge $40 for the basic kit, and $79 for a deluxe kit with an irrigation system. Nourishmats may be an intriguing option for people with small yards, but what's an apartment dweller to do? Fortunately, there has been an explosion in indoor or balcony hydroponic systems. We covered the window farming movement a few years back, and it's still going strong. And recently, Treehugger.com put together a slideshow of 12 different plug-and-play hydroponic systems for indoor micro-gardening, ranging from aeroponics, a method of growing plants in hanging containers with little to no soil, to aquaponics, which involves growing plants (or fish) directly in water. Plastic and ceramic pots and wooden boxes are also tried-and-true containers for gardening on balconies and deck, but there's been innovation in these containers, too. A few companies have developed polypropylene bags – designed to be porous and lightweight – for growing potatoes, tomatoes, peppers and other crops. According to Gardener's Supply, one company that sells these grow bags, polypropylene fabric is superior because it "'breathes' and 'air-prunes' roots."